Cricketer Irfan Pathan is being trolled on Twitter for posting a picture of himself with a Rakhi on his hand. Pathan, on the occasion of Raksha Bandhan, took to Instagram to post a photograph of himself with a Rakhi tied around his wrist. 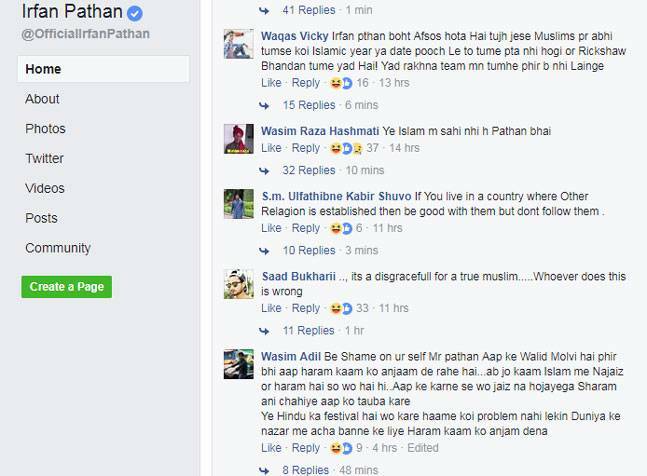 In no time, Irfan has become a target of so-called Islamic radical trolls who lashed out at him for celebrating a Hindu festival despite being a Muslim. This is not the first time when Irfan has been targetted by trolls on social media. Last month, he was trolled when he posted a picture in which his wife was seen wearing nail polish and revealing her arms. Other cricketers like Mohammad Kaif and Mohammed Shami were also attacked on social media. Kaif was trolled for posting a picture of himself playing chess with his son while Shami was attacked twice (one, when he posted a picture of his wife wearing a sleeveless gown and other, during his daughter’s birthday party).